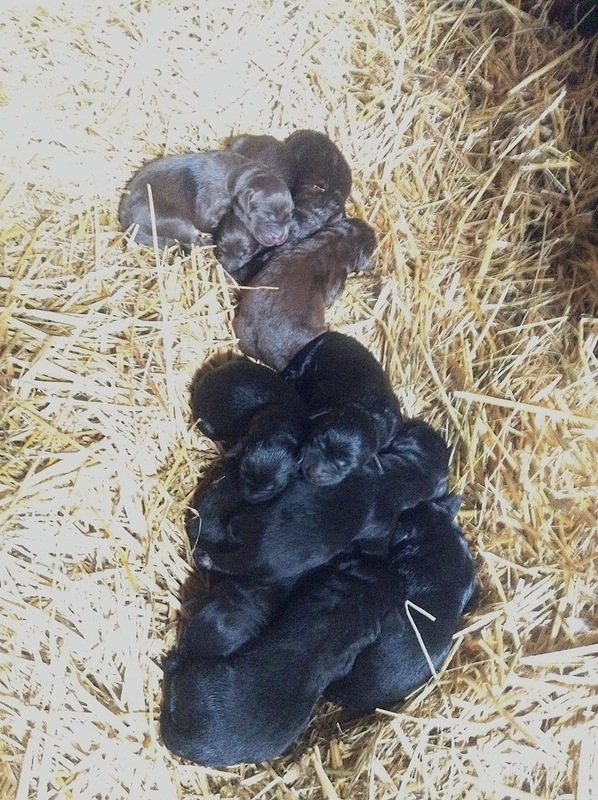 She had a litter of 12 adorable little chocolate and black puppies! Click here to view the “Choose your puppy” post! 8 Week Pick-up Date: As soon as you can. 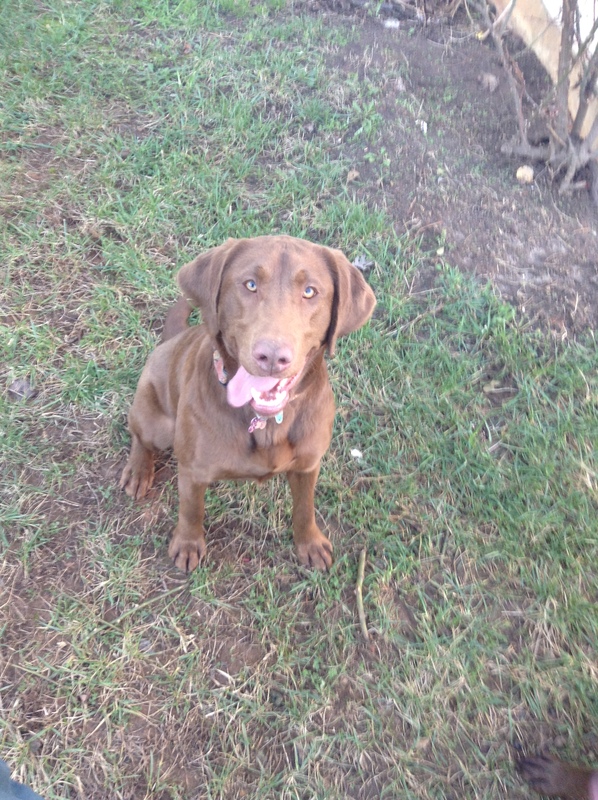 Mother: Rosie is a beautiful energetic light brown lab.She is a little over 2 years old and this is her first litter. She loves to swim, fetch, and run with us. Her parents, pedigrees are full of hunting championships and we definitely see that in her as well. She is about 65-70 pounds. 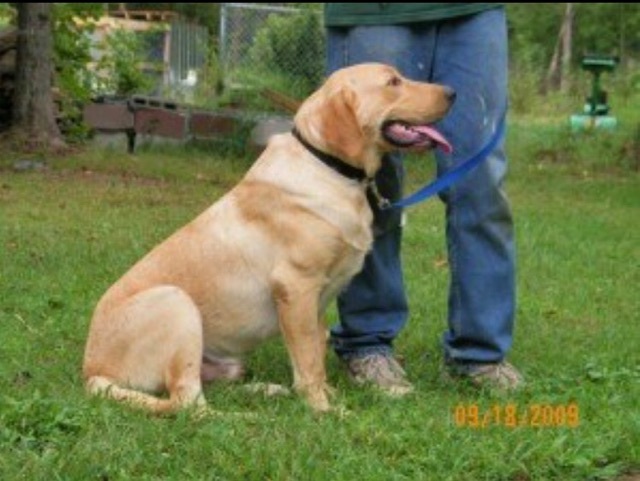 Grizzly is a beautiful Golden English lab from Old Dominion Labradors he is a strong, healthy, and happy dog. He is about 100 pounds. We ask for a $100 deposit to secure your puppy. These puppies will have their first round of shots and wormed. They are well socialized with children and other animals. We feed them Fresh Raw Milk and meat, they also get some healthy dry dog food. Click here to read the 6 most commonly asked questions. Please contact us with any questions or for an application! A Lab Puppy from Our Father’s Farm is a friend you will cherish for years. Labrador Retrievers have an enduring reputation for gentle temperament, ease of handling and training, intelligence and loyalty. They are truly the perfect family pet! We breed for quality in health and not quantity of puppies. We raise our dogs and allow them to have puppies because we love and need them and want to share them with others. Dogs raised in a loving environment, well socialized with all ages of people and animals are rare today. Another wonderful thing is that our puppies stay with their mothers for at least 8 weeks of nursing. Their weaning process starts naturally using raw cows milk, meat, eggs and other of our beyond organic fresh farm foods. Our local vet does our new puppy checks and says that they are some of the healthiest pets she has ever seen. Another customer commented, a year after purchasing one of our pups, that a friend of his had a lab the same age which had been dealing with all kinds of health issues, but his puppy was in perfect health. It is well known that the diet and upbringing any creature experiences from birth through childhood makes a life time difference in the health and immune system of the adult! We believe this very strongly and at Our Father’s Farm we seek to mimic the way things were divinely designed to function. We have been doing what we do for almost 7 years now and have seen the fruit of hard labor again and again as we observe and enjoy superior health in the animals on the farm.